The market for Luxury Homes in Phoenix is diverse and inviting, just like the people who live here. Being among the top ten largest cities in the United States, Phoenix, Arizona is home to growing industries and successful professionals. This population of affluent and hard-working people has created the demand for upscale luxury homes in Phoenix. Luxury real estate, from downtown Phoenix luxury condos to sprawling Phoenix mansions, is spread throughout various parts of the city. They include some of the most beautiful homes in Arizona, many of which are currently priced competitively to ensure that Phoenix luxury home buyers get the best possible value for their dollar. Beautiful luxury developments in Phoenix and communities abound within the areas of Phoenix AZ, Scottsdale AZ, Paradise Valley AZ, Carefree AZ, Cave Creek AZ, Peoria AZ, Glendale AZ, Tempe AZ, Anthem AZ and Downtown Phoenix. In the heart of downtown Phoenix you will find urban and upscale lofts with views to take your breath away, and in the surrounding high end communities you will find truly amazing luxury estates. Luxury homes are abundant throughout our area, and MyOwnArizona's Phoenix Luxury Resource Guide has the resources you need to find your dream luxurious home. View listings of luxury homes in Phoenix below. For more information, click on links to MLS searches from current luxury homes in Phoenix area. Looking for a luxury home in Phoenix area? Above is a list of luxury homes for sale in Phoenix metro area with a price tag of more than $700,000. These homes are located in Gainey Ranch, Trilogy At Vistancia Silverleaf Scottsdale, McCormick Ranch, Estancia Scottsdale, Desert Highlands Scottsdale, McDowell Mountain Ranch, Whisper Rock Scottsdale, JW Desert Ridge in Phoenix, and Mummy Mountain, upscale suburb such as Paradise Valley or other upscale Phoenix community. Wherever you are looking, we can assist you. The list above also includes real estate listings of the most luxurious properties in Phoenix, Phoenix mansions and multi-million dollar estates in Phoenix AZ. Luxury Homes in Phoenix Agents, Luxury Home Phoenix Lenders, Luxury Real Estate Title, Luxury Resorts Condos Escrow, and Phoenix Mansions Inspectors are all important members in the Arizona real estate purchasing process. They must be the highest level of service and they must work together as one. Your phoenix MyOwnArizona realtor is the best coach in assembling the MyOwnArizona Team. The top Arizona realtors serving the Phoenix area in the industry. Let our MyOwnArizona business professionals be of assistance to you and your needs. Email us at: info@MyOwnArizona.com for Phoenix Luxury Real Estate For Sale real estate. Phoenix Arizona area culture, sports, shopping & entertainment, outdoor adventure, golf -- the State of Arizona has it all. Whatever your lifestyle, our MyOwnArizona agents will find an Arizona community to match. And maybe introduce you to some Phoenix Arizona neighborhoods you've never considered or even knew existed! 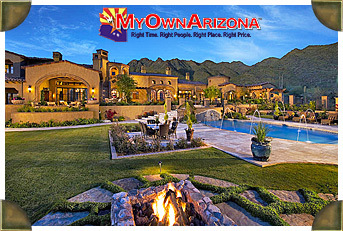 Whether you are interested in buying Phoenix Arizona luxury real estate or selling Phoenix AZ luxury property in the State of Arizona, work with someone like MyOwnArizona: professionals who want to earn your business. We are here to work along of you.